Il Campionato Nazionale ed Europeo si svolge su sei/sette Tatami ed una gabbia. 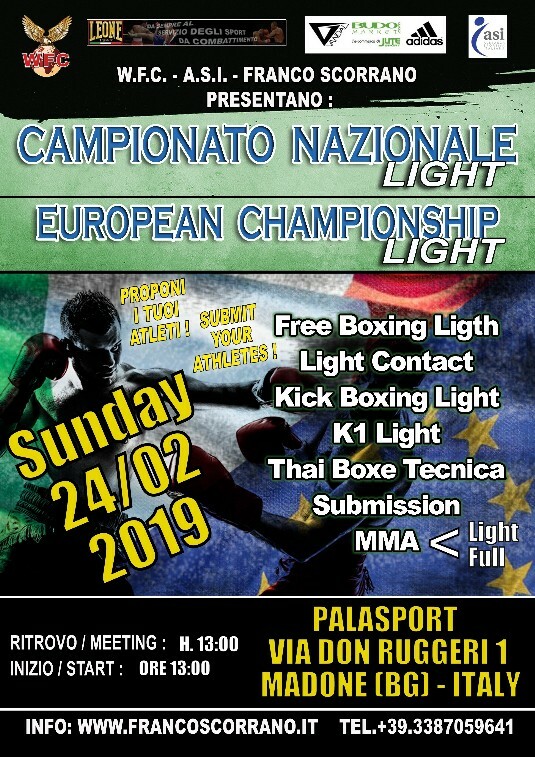 Le specialità presenti sono: Free Boxing Light (Boxe Inglese a contatto leggero), Light Contact, Kick Boxing Light (low kick), K 1 Light, Thai Boxe Tecnica, Submission/Grappling e Mixed Marrtial Arts Light e CONTATTO PIENO. Gli atleti non affiliati a W.F.C. dovranno versare la somma di €. 15:00 per acquisto di Licenza o Budopass con validità di 12 mesi. Categorie: fino a 11 anni Attività Ludico-Sportiva (iscrizione 10,00 €. ), da 12 a 14 anni, da 15 a 17 anni e oltre 18 anni. Iscrizione €.20,00 + €.5,00 per ogni disciplina aggiuntiva. Al vincitore verrà assegnato il Titolo di Campione del Mondo e la relativa cintura. Premiazioni fino al 4° classificato. Ogni team può portare uno o più arbitri, che dovrà assumersi l'onere di tutte le spese, l'organizzazione non pagherà nulla. Gli atleti non affiliati a W.F.C. dovranno versare la somma di €. 15,00 per acquisto di Licenza o Budopass con validità di 12 mesi. The European Championship takes place on six / seven Tatami and a cage. The specialties are: Free Boxing Light, Light Contact, Kick Boxing Light (low kick), K 1 Light, Thai Boxing Technique, Submission / Grappling and Mixed Marrtial Arts Light and FULL CONTACT. Athletes are not affiliated with W.F.C. They will have to pay the sum of €. 15:00 for the purchase of License or Budopass with a validity Categories: up to 11 years Ludico-Sport activity (registration € 10,00 ), from 12 to 14 years, from 15 to 17 years and over 18 years. Registration € 20.00 + € 5.00 for each additional discipline. The winner will be awarded the World Champion Title and the related belt. Awards up to 4th place. Each team can bring one or more referees, who will have to bear the burden of all expenses, the organization will not pay anything. Athletes not affiliated with W.F.C. must pay the sum of €. 15.00 for the purchase of a License or Budopass valid for 12 months. Le championnat Européen se déroule sur six / sept Tatami et une cage. Les spécialités sont: Free Boxing Light, Light Contact, KIck Boxing Light (low kick), K 1 Light, Boxe ThaïlandaiseTechnique, Soumission / Grappling et Arts Martiaux Mixtes Light et FULL CONTACT. Les athlètes non affiliés à W.F.C. doit payer la somme de €. 15h00 pour l'achat d'une licence ou d'un Budopass valable 12 mois. Catégories: jusqu'à 11 ans d'activité Ludico-Sport (inscription € 20,00), de 12 à 14 ans, de 15 à 17 ans et plus de 18 ans. Inscription € 20,00 + € 5,00 pour chaque discipline supplémentaire. Le gagnant recevra le titre de champion du monde et la ceinture correspondante. Prix jusqu'à la 4ème place. Chaque équipe peut amener un ou plusieurs arbitres, qui devront supporter le fardeau de toutes les dépenses, l'organisation ne paiera rien. Athlètes non affiliés à W.F.C. doit payer la somme de €. 15,00 pour l'achat d'une licence ou Budopass valide pour 12 mois.